I’m not Italian, but maybe I was in my past life because I am all about pasta, pizza, and MEATBALLS. 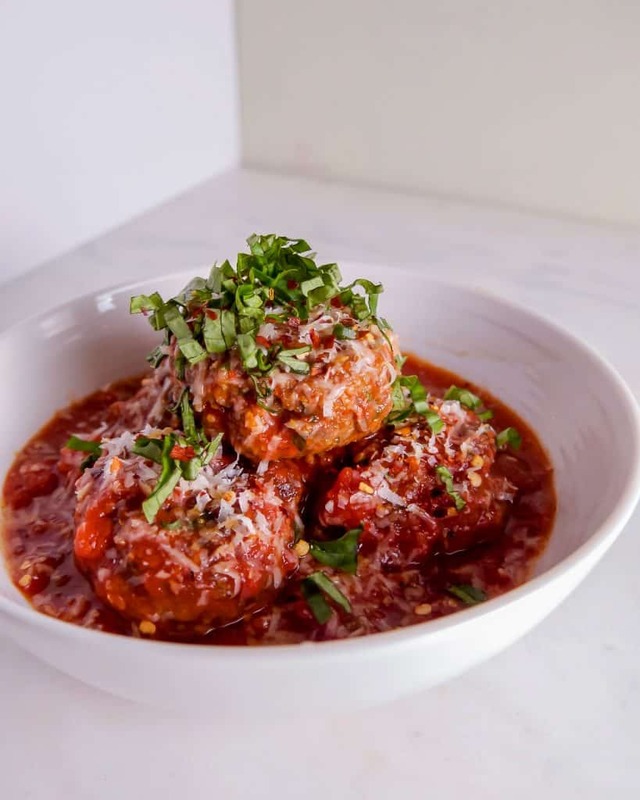 Meatballs just scream family and comfort food. 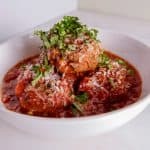 Although these meatballs and homemade sauce are NOT traditional (please don’t judge me real Italians), this recipe is so flavorful and perfect for a Sunday night meal with the ones you love. 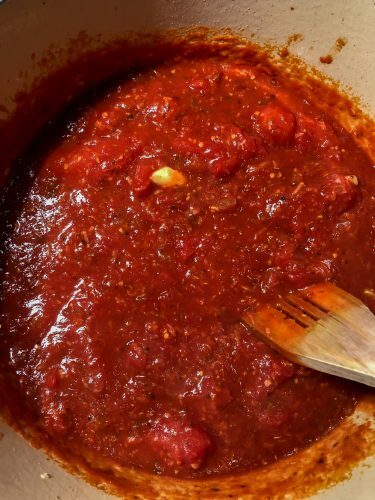 If you’re in a rush you can totally use store bought red sauce (which I also do myself), but if you have the time to make a sauce from scratch its so fun and rewarding to see all the flavors develop. 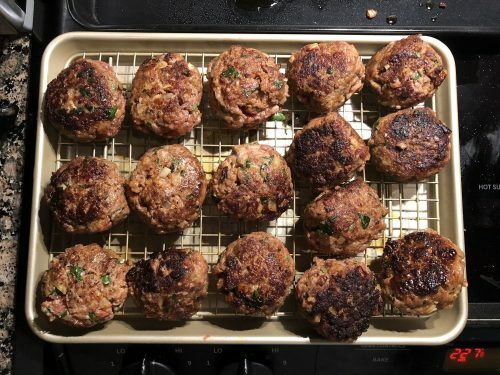 First, lets talk meatballs. So here is where you can choose your own destiny aka the meats that go into a meatball. Typically you see combinations of beef/lamb/pork/veal, but people have different preferences. I love spicy, so with my meatballs I use hot Italian sausage, ground sirloin, and veal. You can substitute whatever floats your boat, we are just looking for a meat combo that comes out to 1.5lbs. Second, lets talk size because size does matter when it comes to meatballs. I roll mine into about 1 1/2inch balls which are perfect for meatball subs, by themselves, over pasta, etc. You can make them smaller but remember cook time will differ. Regardless of size, we are looking for 160 degrees F internal temperature to signal they are done. Also, I put olive oil on my hands prior to rolling so the mixture doesn’t stick to my hands. Third, we have the most controversial meatball topic, cooking style. I personally pan sear my meatballs and then I finish them in the sauce. Some put their meatballs in the oven (I have done that too) and then put them in the sauce when they are ready to go. Some people let their meatballs bathe in the sauce for hours and I do not do that. I allow my meatballs to sit in the sauce jacuzzi for maybe max 30minutes because even though they are in sauce they can still dry out. Remember: we are looking for that 160 degrees. So how do you get that meaty flavor into your sauce? 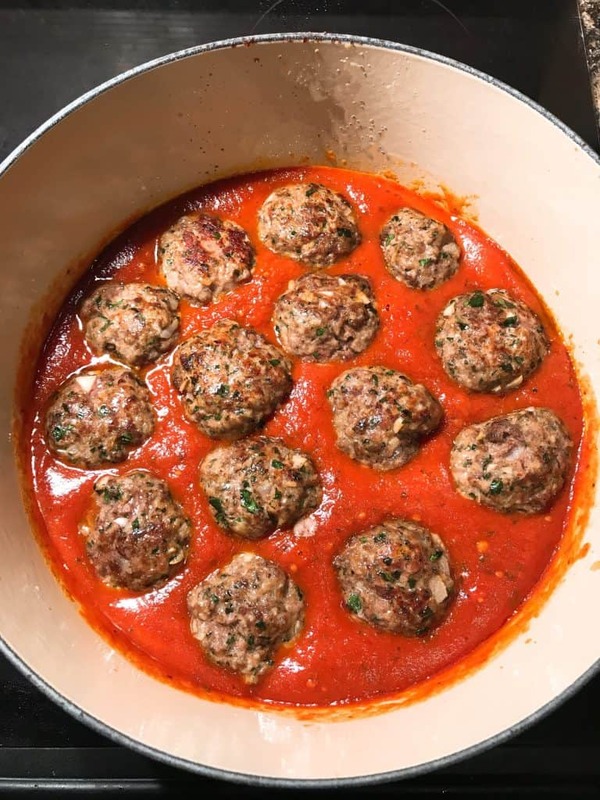 By searing the meatballs in the dutch oven prior to making the sauce, you have the leftover bits and flavors that are left behind when you start the sauce. Now lets talk sauce. Like I mentioned before, theres no shame in the store bought sauce game (I do that all the time). I usually always get arrabbiata because I love the extra spice, but you can get whichever. As far as making the sauce from scratch I have some special ingredients that go in. 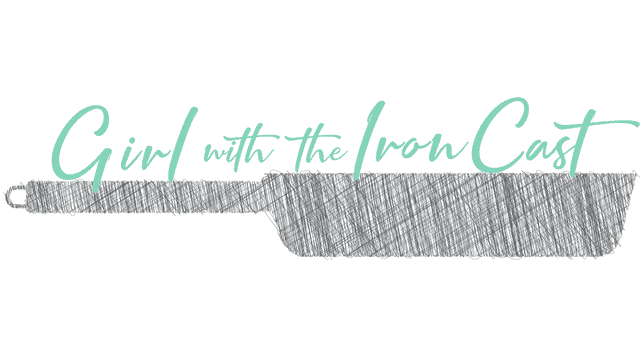 Starting with anchovies (please don’t immediately close the tab, hear me out). I am not a fan of anchovies unless I am making sauce. When you put anchovies in hot oil, they dissolve and give your sauce so much umami aka FLAVOR BOMB. Please don’t write them off so fast and try it at least once, I promise the sauce doesn’t taste fishy at all. 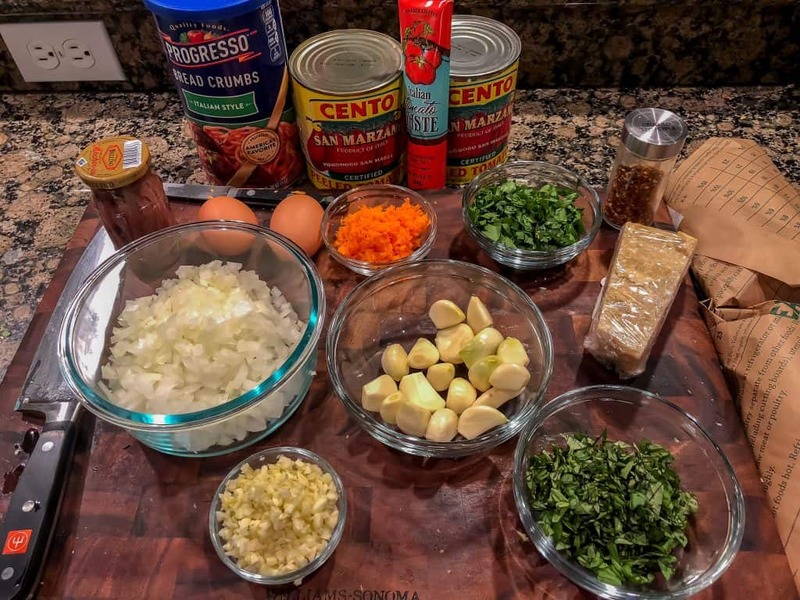 I also use carrots in the sauce which is not traditional, but I grate them into the sauce along with grated garlic so the max flavor comes out of them. 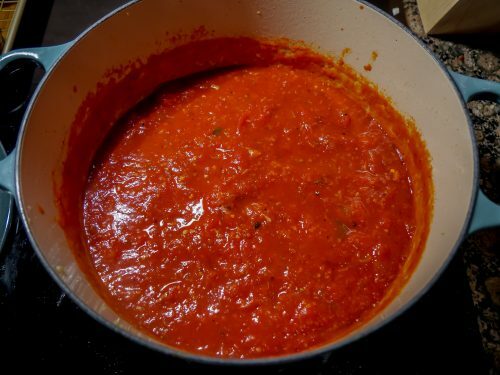 When it comes to the consistency of the sauce, I break up the san marzano tomatoes as I go but if you aren’t partial to having a chunky sauce you can use an immersion blender to thin it out. What are we left with? 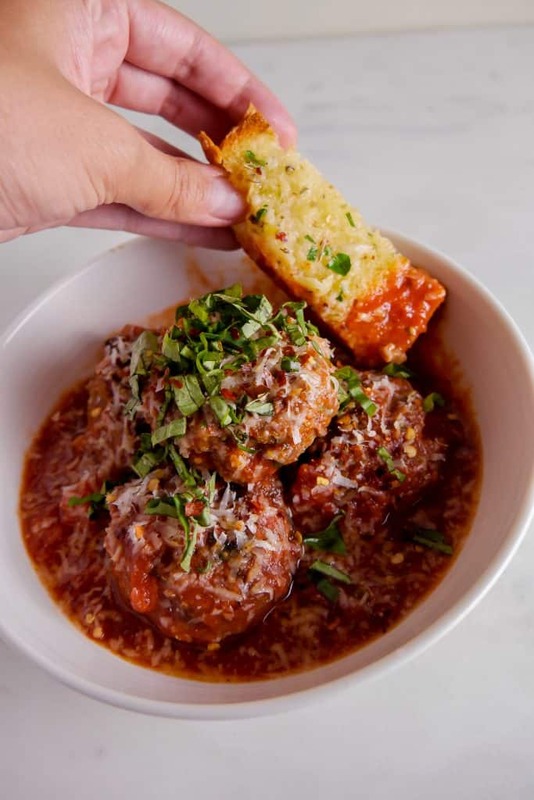 Flavorful, moist meatballs with homemade sauce that is perfect for dipping my homemade garlic bread in. In the dutch oven, over medium heat add 2 tbsp of olive oil and sautee onion and garlic for 3-4 minutes. 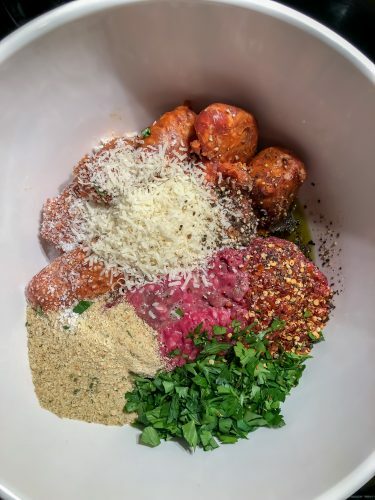 Transfer to a mixing bowl and add all the meatball ingredients (minus the 1/2 cup olive oil). 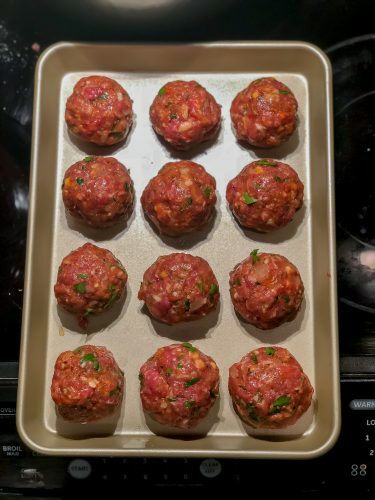 Using your hands mix the meatballs until ingredients are all combined. Form balls with your hands (I usually form mine into 1 1/2in balls) and place aside. Heat 1/2 cup olive oil in dutch oven on med/high heat. Add the meatballs and pan sear 2 sides for about 1 minute on each side. I did it in two batches. Set aside on a pan and start the sauce once all the meatballs have been pan seared. Leaving the oil in the dutch oven, add the anchovies. Once they are dissolved, add the onions and sautee until they begin to soften about 3-4 minutes. Then add the grated garlic and carrots to the sauce, let cook another minute. Open 2 cans of san marzano tomatoes and add to the sauce. Mix in the sugar, red pepper flakes, oregano, and fresh ground black pepper. Using your cooking utensil break up the tomatoes in the sauce and bring to a boil. Once it begins to bubble lower the heat to simmer. Now is the time if you do not want a chunky sauce to use the immersion blender. Then add the fresh basil, stir the sauce, and add the meatballs. Let the sauce and meatballs simmer for 30 minutes. The meatballs should reach an internal temperature of 160 degrees.